Heat a medium sauté pan over medium high heat. Add mushrooms to pan and sear until golden. Cook to eliminate any water. Spray an 8x8 baking dish or round. Pour egg whites into baking dish. 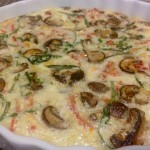 Scatter cooked mushrooms, basil, sun dried tomatoes and parmesan across egg whites. Place on a sheet tray. Bake for 23 minutes at 350 degrees. Slice and serve.